1 Million downloads! Woohoo! Thank you all for the support! As I made the 1.2 update recently I don't have a lot of new things to show to celebrate but I will post the renders of some Atmosmobs mobs that are pretty much done below :) Cheers! By popular request; I have uploaded the 1.7.10 release and 1.10 alpha here; please be aware that those do not contain a lot of the features described here! Instead look here (for 1.7) or here (for 1.10). Thanks! Teaser for next version in celebration of 500k downloads!! 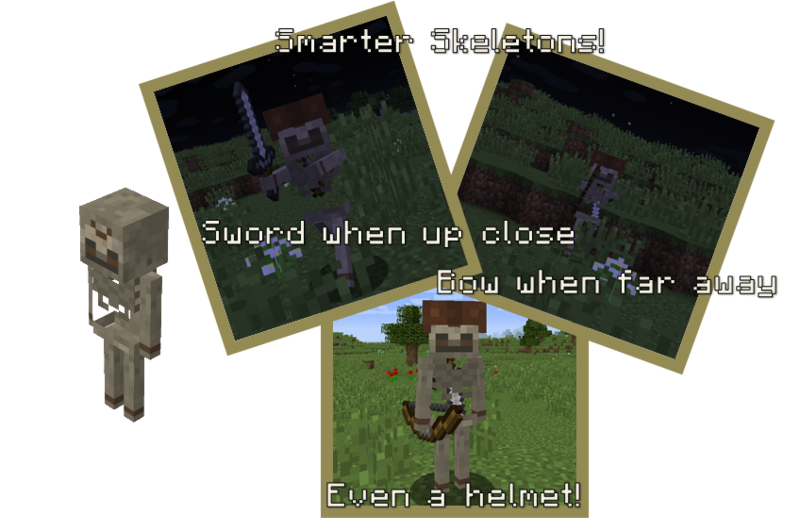 Here follows the info on all current mobs added by this mod. Special Info: Can be tamed with Melons and bred with Fermented Spider Eyes. Tamed Chameleons follow you around. Right-click with empty hand to make them sit still. The color changing effect supports modded blocks and resource packs. Special Info: Rare items, like Diamonds, are obviously very rare. The loot they spawn with can be changed through loot tables (see section below). Modded items are supported. Sometimes one can spawn without an item inside. Right-clicking it with a Slimeball will "tame" it. Follows you around when tamed. Right-click with empty hand to make them sit still. 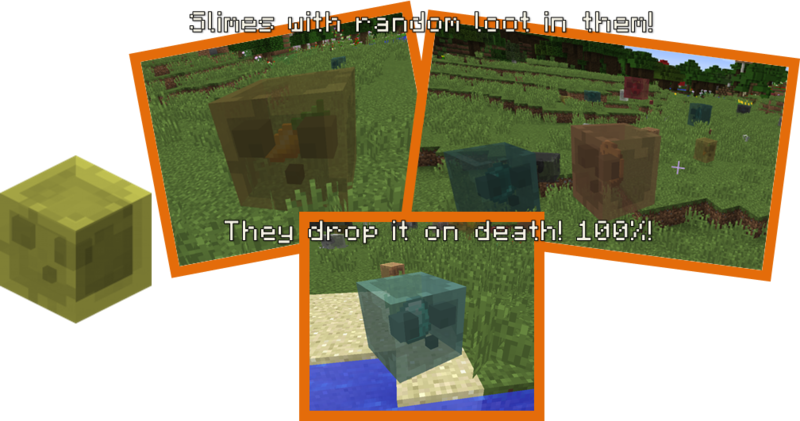 You can also put any item inside of the tamed slime and see their colors change! Special Info: Modded enchantments are supported. Special Info: Higher tier tools, like Diamond, are obviously very rare. The tools they spawn as can be changed through loot tables (see section below). Modded tools are supported. 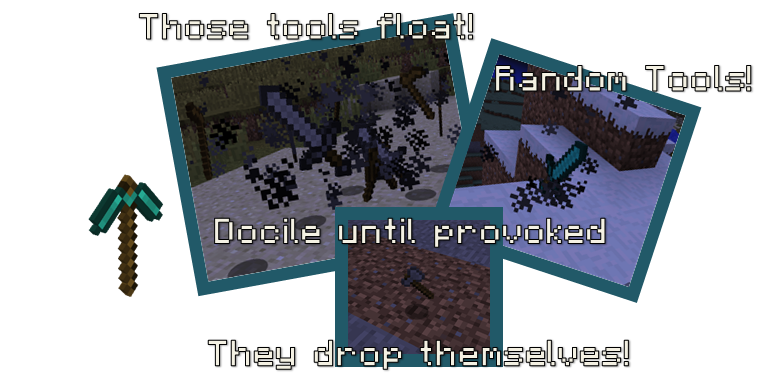 Use a Looting sword to kill them for tools with better durability! Special Info: Follows you around. When led to the surface (above y=50 and when he can see the sky) OR when near a village, you can right-click him for 2-4 emeralds as reward! 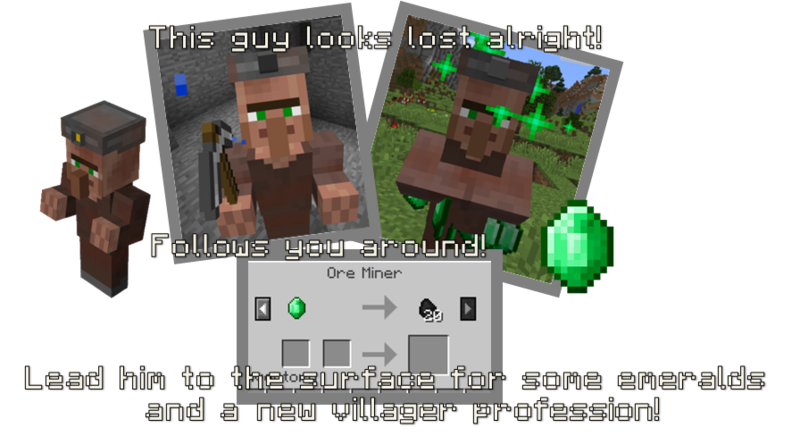 They will then change into a normal villager with the unique Miner Profession. In the config settings, you can enable the Miner Profession to spawn in villages as well. Their villager noises can also be disabled. Special Info: Offers some unique trades which are balanced around vanilla trades; most of their stock cannot be found in villages. New trades unlock like with normal villagers. Follows you around when you show emeralds. 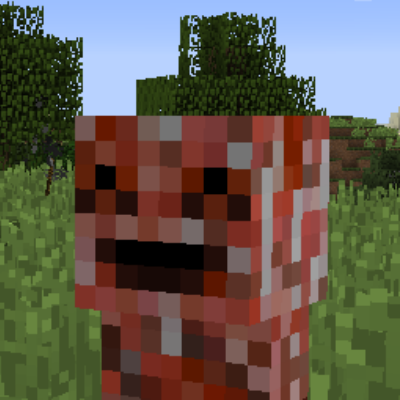 He does despawn like other mobs, therefore the name; however you can make them settle by bribing them with an emerald block (they won't despawn then). This can be disabled in the config. Special Info: Look at that smug! Once close, they wait a bit before they launch themselves upwards and come down to the ground to explode in your face! Explode like normal when they do not have enough space to jump. 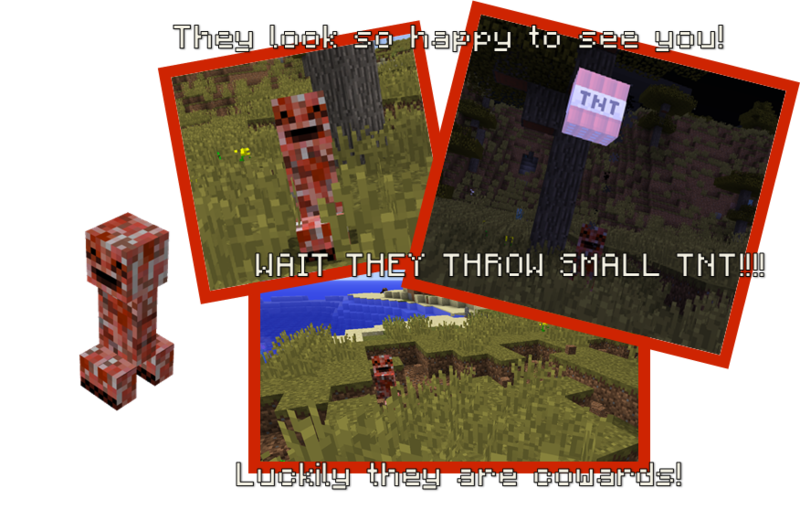 Special Info: They throw small blocks of TNT at you, but run away when you get too close. Their explosion terrain damage can be disabled in the config settings. 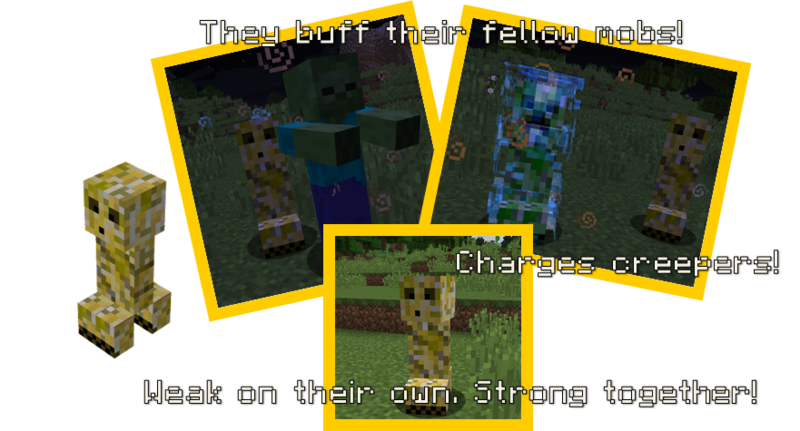 Special Info: They buff a mob near them with Potion effects (Fire Resistance, Strength and Speed) and follow it around. They also charge Creepers if they choose to buff one. Explodes and becomes aggressive like normal when below half health. 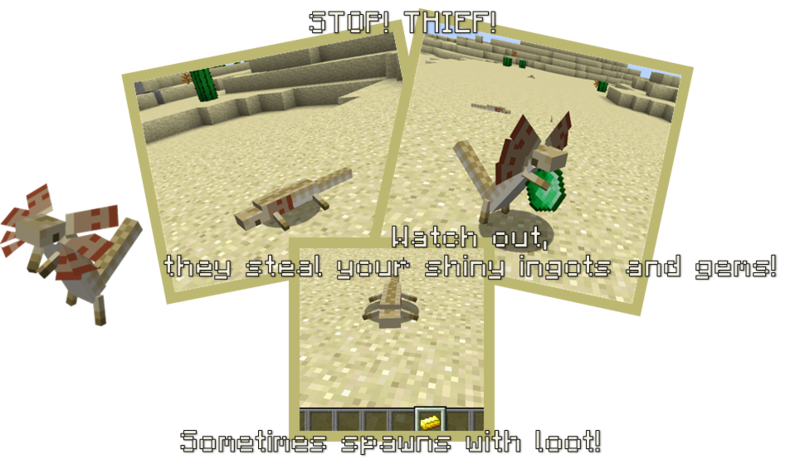 Special Info: They will sneak up to players who have ingots or gems in their inventory, and steal one when close. They drop their stolen item when hit once and run away. Sometimes they spawn with an item already, allowing you to steal from them instead. The items they like can be changed through loot tables (see section below). The chance they spawn with an item can be changed in the config settings. Special Info: They wait for unsuspecting animals or players to come by, to surprise attack them! They particularly hunt Squids. Suffocates on land. Special Info: They associate with a specific tree. Modded trees are supported. Grove Sprites will plant the saplings they hold overtime (does not happen too often). They will also help saplings of their own type grow! Give a Grove Sprite a sapling of their own type and they will no longer despawn. Giving a sapling increases their sapling inventory; which also increases overtime. Their inventory decreases by planting sapling or by right-clicking them with bonemeal, which yields Wonder Sap! Wonder Sap can be put in a crafting table together with any type of log to convert it to the Grove Sprite type log! Special Info: They act like chickens, but have some additional benefits. Their meat is very nutricious and probably the best food compared to vanilla Minecraft (when cooked). They change Grass blocks into Mycelium every once in a while (can be disabled in the config). They also, very infrequently, lay Dodo Eggs. However there is a catch to all this; their breeding item changes everytime and you only know through trail and error. They choose between: all seeds (including cocoa beans), all crops, all fruits and all mushrooms (vanilla items). They spawn everywhere near Mycelium, also outside of Mushroom Islands. Special Info: Mother Spiders become enraged and stronger when you attack her babies! Sometimes a Mother Spider will drop a Spider Egg, which can be used to summon a Baby Spider that will fight for you. Use the Spider Shell to retrieve the baby. The maximum amount of babies the mother spawns with can be changed in the config settings. Baby Spider raising: Once you release a baby spider from an egg it is "tamed" and will follow you around and attack for you. They can be set to "sit" by sneaking and right-clicking. They can be fed Fermented Spider eyes to have them grow one stage; doing so will NO LONGER allow you to retrieve the spider in an egg. Use 5 Fermented eyes to have it grow up into a full spider. Their eye color is random but can be changed by right-clicking them with dyes! Right-click a fully grown spider to ride it! Special Info: They will jump on player heads and start damaging them. Multiple Brain Slimes can stack up, causing more damage. Hit them, to cause them to fall off. 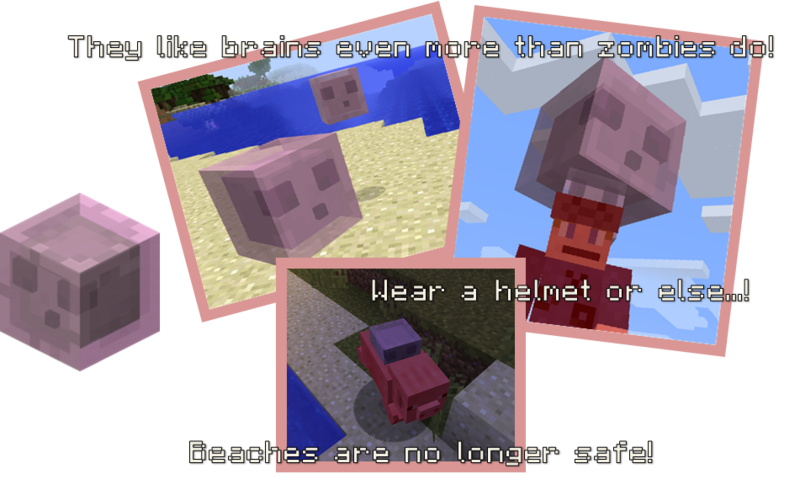 You can also wear a helmet to prevent damage; however the helmet will take damage instead. Smaller Brain Slimes will grow after "sucking" brain 10 times; making them stronger. Special Info: Chests now generate in your caves (generation rate can be changed in the spawnrate config). 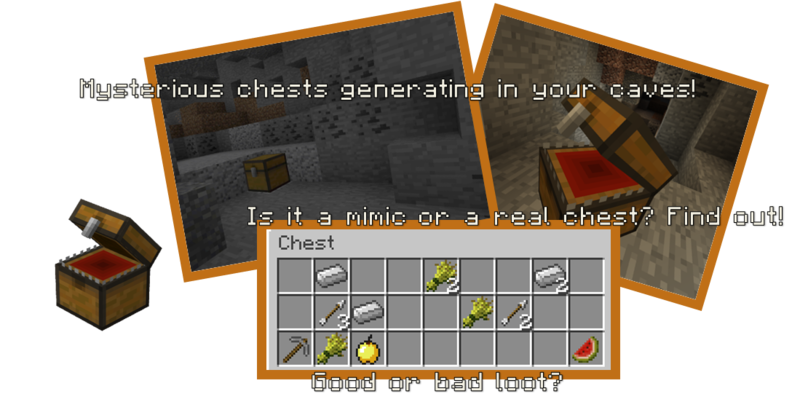 When encountering such a chest and trying to open it there is a 1/3 chance of it being a Mimic, a 1/3 chance of it being a mob trap with mob drops in the chest and a 1/3 chance of it being regular loot which varies in value (balanced around vanilla). Sometimes it contains a Mimic Orb (see item section). The mimic loot uses loot tables, so they can be adjusted like normal. Special Info: Their arrows apply weakness, so watch out! Special Info: Attacks in a zig-zag pattern, making bows hard to use against him. Special Info: Has three attacks: Throw block, smash ground and just a regular melee attack. He is not very smart, but can do serious damage when he hits you. 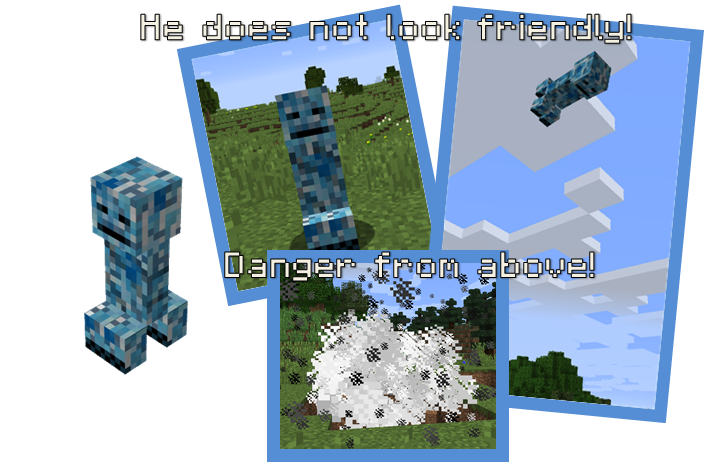 He senses players from far away so if you hear explosions while spelunking, be careful. Turns to stone when exposed to daylight. When stone, only pickaxes hurt him. His smash attack can be disabled in the config settings. Special Info: A FlameSpewer will try to get in range of their target player. They then inhale lava; shown by their lava coat. During that animation they cannot be harmed. When ready, they shoot a barrage of flames at their target! They suffocate on land and will try to move to nearby lava pools slowly. They receive large amounts of damage when exposed to water. Special Info: They look like your basic melee enemy; however their maces damage 10% of the durability of one of their target's armor pieces! Make sure to keep your distance. They also attack villagers, simply because they don't like the look of em. Special Info: They approach slowly in the air and then SWOOP up their target, grabbing them by the head. Then they quickly rise and rise up in to the air! They will drop their victim once they reach a certain height or when they are damaged. So quickly punch them when you get grabbed! Special Info: These creeps can be found near the void layer. They gaze at their target THROUGH WALLS! However their harmful gaze is weakened while piercing walls; causing it to only inflict blindness and hunger upon their target. But when fully exposed, they can deal some serious armor-piercing damage. Once you see their eyes in the darkness, make your way to them by mining and deal with them swiftly before they can harm you. They can also teleport on hit; making them even trickier. Good luck! Camouflage Armor: Crafted using Camouflage Dye and Leather Armor. It's color will change just like a chameleon when worn! 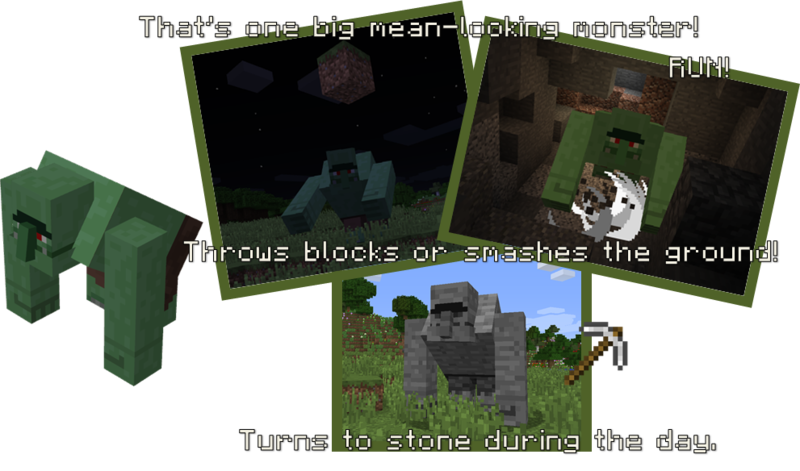 A full set will allow the player to sneak past mobs as it significantly reduces their detection range towards the player. Spider Egg and Spider Egg Shell: Spider Egg is dropped by Mother Spiders. Can be thrown to get a tamed Baby Spider and a Spider Egg Shell. The shell can be used to retrieve the Baby Spider (right-click them). Raw and Cooked Dodo: Dropped by Dodos. Cooked Dodo has very high saturation and hunger values. Dodo Egg: Dodos lay these. Small chance to spawn a baby Dodo when thrown. Wonder Sap: Dropped by Grove Sprites. Also can be gained by giving them Bonemeal. Wonder sap can be used to convert one type of logs into another. Mystery Eggs: Rare drop by Primitive Mobs Creepers. I wonder what they do? Goblin Mace: Rare drop by Goblins. This mace reduces the durability of one of the opponent's armor pieces by 10% each hit! Mimic Orb: Joke item dropped by Mimics. Can be used to convert a normal chest into a Mimic chest! To change the SPAWN SETTINGS of mobs; please do so in the MultiMob config! The config can be accessed from the menu in-game. In 1.13 you will be able to change these through data packs, but for now you will need to put your custom loot tables in your_world/data/loot_tables. See here for more details on how to do this. 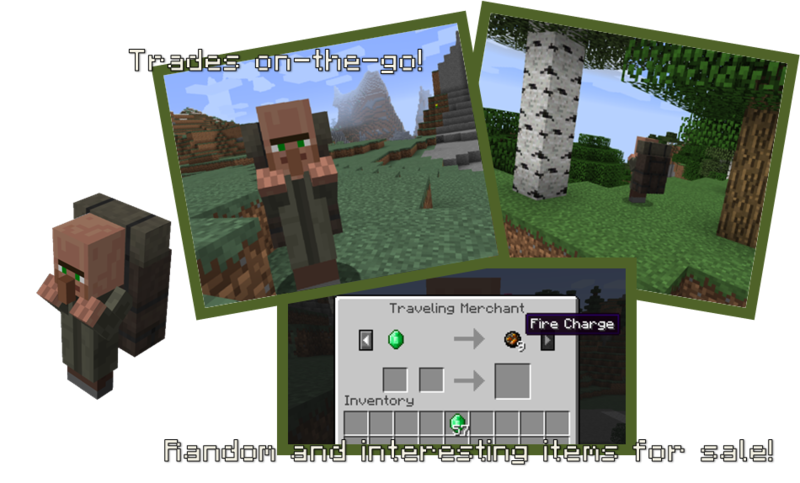 - Villager trades, Mimic loot and mob loot are shown through Just Enough Resources' menus. - SinaMegapolis made support for the camouflage dye for their More Dyeable Armor mod! - Not all features from the old versions are in this version. - Always back up your save when updating to a new version of this mod, especially in the beta state. There is always a chance it causes issues. You are allowed to use this in a modpack as long as credit and a link to this page is provided. - I recommend using Cave Generator by pperson and then using large caves as that creates a great and scary underground! Please do NOT report bugs in the comments sections; report them by clicking Issues in the menu bar above. Also, stay civilised. Thanks for all the support! Imagine if the harpies were the flying monkeys from The Wizard of Oz instead of human vultures? Leebles could be awesome as a separate mob. Hello, first of all congratulate you for all the work you have dedicated to the mod, you have created something really cool. I can confirm, after several tests I have discovered that sponge is the mod that causes the mobs not to be generated naturally. When… will… Atmosmobs… be… developed… more… then… released? I know, I am just asking. I understand and respect that he has a life, and am literally just asking. I don’t care if he takes a year. The loot table editing doesn't seem to work for me although i'm positive my code isn't wrong. Is it supposed to work with other mods? I like this mod, i started to use it in 1.12.2. But in the JAR i found in entity rareanimals folder, where is blaze cow and other rare animals' textures too. Sometimes i like to check the JAR files. I would like to know, are they spawn in Minecraft, or not? 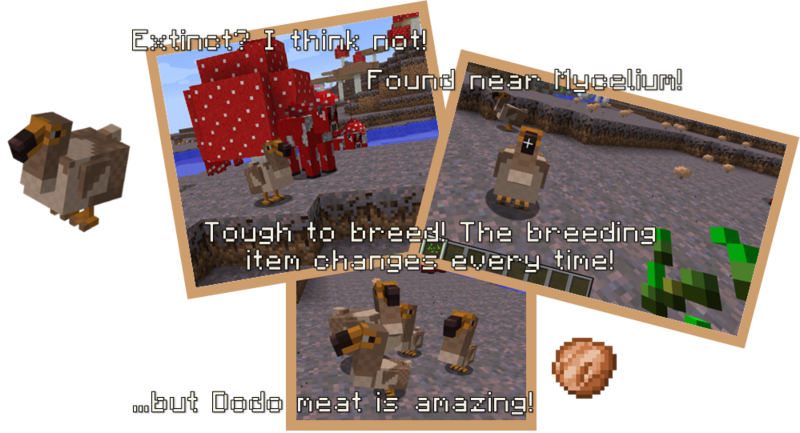 Except the dodo (i saw there the dodo's texture too), because i know it's spawn rarely. 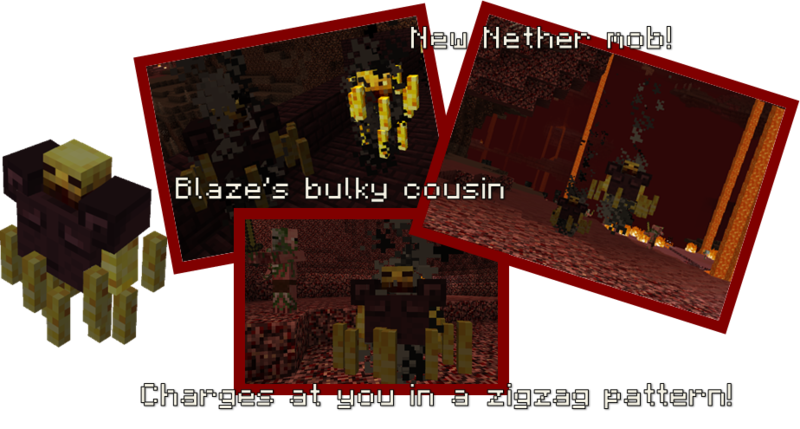 And if the blaze cow, sheeper and Ender chicken spawn, how they spawn and where? Since i saw on the Minecraft forum that mod and there i did read the blaze cow spawn in overworld on Netherrack, the sheeper spawn in overworld on mossy stone and the Ender chicken spawn in overworld on End stone. I tested it in 1.12.2, i did put in a creative world on area mossy stones, Netherracks and End stones, i walked around and i waited, but they are didn't spawn. So in 1.12.2 how can we meet them? So? I waited few weeks, please answer to my last comment! Thank you. Hmm ok, but it's strange he/she not answer. I waited across few weeks, nobody can't say i didn't wait patiently. If i ask it every 2-3 days, then i understand it's much. But in that case it's not. And he/she came here not so rarely, that's why a bit strange he/she is not answer nothing. It says the file is about 540KB, but the one here in BETA for 1.12.2 ( primitivemobs-1.2.3a.jar) is much bigger. Which one should I be using, aka which one is less buggy/more stable? 9Minecraft steal mods illegally. Never use it, as it may come with several viruses and it is just against the law. If i have dynamic trees installed, will grove sprites plant the dynamic tree seeds? This a repost of some feedback I wrote for this mod that I don't think you saw. Blazing Juggernauts and Skeleton Warriors need heavy nerfing. They are too powerful and spawn too often. Skeleton Warriors spawn more often than actual skeletons do, and they're too op. The weakness they gives you only lets you do 1 damage to them with an iron sword. Please make them give a lower level of weakness and have them spawn less often than skeletons do, just like how baby zombies spawn less often than zombies. Now for the Blazing Juggernaut. They spawn WAY too often, just like the skeleton warrior, and do tremendous amounts of damage. When I shoot one down, two more pop out of nowhere. And please nerf their damage, them taking out only 2 hearts without armor will do. Other than that, this mod is perfect I love all the mobs and their unique AI. Really spices up the world. Also, any news on where Atmosmobs is at right now?